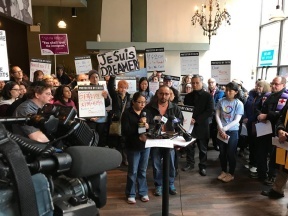 Diverse faith leaders took action on Saturday, March 5th in protest over DREAMers losing their protection from deportation each day. 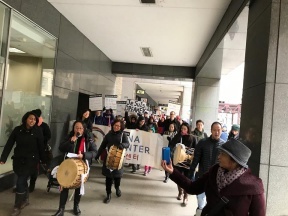 Leaders gathered for a vigil and procession outside the office of the Immigration and Customs Enforcement, 101 W. Congress, to form a human chain in solidarity of the immigrant community. 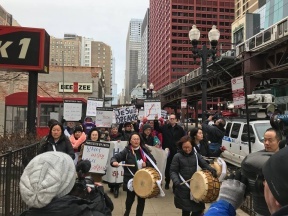 Multi-faith Clergy from and the suburbs, Religious Action Center of Reform Judaism, The Resurrection Project, Jewish Council on Urban Affairs, Southwest Organizing Project, Hana Center, and Healthy Illinois took part in the procession. On September 5, 2017, a solution for DREAMers was promised with a deadline of six months. Now, 987 DREAMers lose their protection from deportation each day. For months faith leaders have been calling for solution, now faith leaders will work to protect all immigrants from deportation.